Parental care is crucial for the survival of mammals, yet species vary widely in the extent and type of care they give to their young. In species where females mate with multiple individuals (polyandry, or more generally, promiscuity), a male is uncertain whether young in a litter are his own or are sired by another male, whereas a female is always certain she is the mother of the offspring. Thus, in promiscuous species, theory predicts that males will provide less parental care than females. By contrast, in monogamous species males are more certain of paternity and, therefore, males also tend to exhibit more parental behavior than in promiscuous species. The correlation between monogamy and paternal behavior has been well documented, but how parental behavior evolves at a genetic level, and how the brain is affected by these genetic changes, is still largely unknown. We took up the challenge of characterizing the mechanisms underlying the evolution of parental care. To this end, we chose a system particularly well suited to study this question. 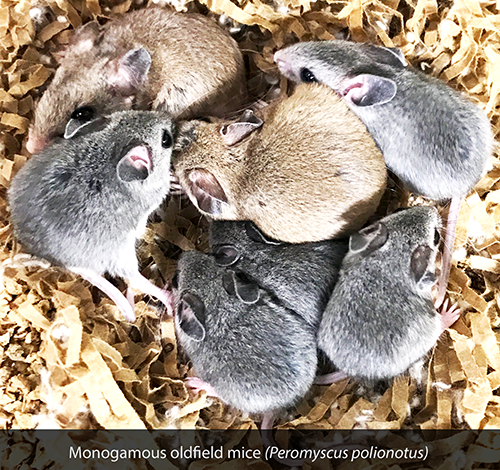 Two sister species of Peromyscus mice (which are as closely related to each other as humans are to Neanderthals) have divergent mating systems: the oldfield mouse (P. polionotus) is both socially and genetically monogamous and the deermouse (P. maniculatus) is highly promiscuous. However, given their evolutionary proximity, these two species can hybridize in laboratory conditions, providing us the opportunity to identify the genetic differences that may explain their variation in parental care. As a first step, we had to test if the predicted differences in parental care existed in our two Peromyscus species with different mating systems. Using a behavioral assay under controlled laboratory conditions, we could quantify the parental behavior of mothers and fathers of both species towards their own pups. We found that as predicted, monogamous oldfield fathers show much higher levels of paternal care than promiscuous deermouse fathers. In fact, their parental behavior is nearly as high as that of monogamous mothers! Interestingly, both monogamous fathers and mothers are in many respects more parental than promiscuous mothers, particularly in the extent to which they build a nest for their pups. So, why do these species exhibit differences in parental care? Monogamous animals may be more parental than promiscuous animals because of the parental behavior they received (nurture) or due to genetic differences (nature). To tease apart these possibilities, we had parents of both species raise pups of the opposite species and then tested the parental behavior of these “cross-fostered” pups once they became parents themselves. Parental behavior of the tested pups resembled their biological parents and not foster parents, consistent with parental behavior being genetically heritable in these species. Having found large and heritable differences in parental behavior between monogamous and promiscuous mice, we then wanted to dissect the genetic basis of these behavioral differences. We first generated second-generation hybrids between the two species and then tested their behavior as parents. By correlating their parental behavior to the chromosomal regions they inherited from each species, we identified 12 genomic regions that affect parental behavior. Remarkably, eight of the twelve regions have different effects in mothers and fathers, indicating that even though monogamous fathers and mothers provide similar levels of parental care, the genetic trajectories by which they evolved high parental behavior was different in the two sexes. Some of the genetic regions we identified affect multiple aspects of parental care – like grooming pups, huddling with them, and retrieving them to the nest – while other genetic regions are associated with very specific behaviors. One of these specific regions modulates parental nest building in both sexes, but it does not affect other aspects of parental care. The next major question was: what are the specific genes in these regions that cause a change in parental behavior? We focused on the genetic region with the strongest association with behavior: the modulation of nest building. To narrow down from hundreds of genes in this region to specific candidates, we searched for genes that showed differences in expression level in the hypothalamus, because this brain area is known to be an important regulator of both social behavior and nest building. Our results pointed to a particularly promising gene known to modulate parental behavior in other rodents, the neuropeptide vasopressin. Vasopressin is expressed three times higher in the hypothalamus of promiscuous mice (which build smaller nests) than in monogamous mice, suggesting that vasopressin inhibits nest building in Peromyscus. To test whether vasopressin indeed suppresses nest building, we injected vasopressin into the brains of monogamous parents. Remarkably, vasopressin administration mirrored the effect of the genetic region encompassing the vasopressin gene: It decreased nest building in both fathers and mothers, but it left other aspects of parental care unaffected. To confirm the inhibitory effect of vasopressin on nest building in a more controlled experiment, we turned to laboratory Mus musculus mice, for which we have more sophisticated tools to manipulate the activity of neurons that release vasopressin. Consistent with the pharmacological results in the monogamous mice, activating the vasopressin neurons in Mus decreased nest building and inhibiting them increased nest building. In summary, we first found large differences in parental care between two sister species of Peromyscus that have strongly divergent mating systems: monogamous mice have few offspring but high levels of parental care, while promiscuous mice produce more offspring but show less parental care, particularly the males. One parental strategy is not better than the other, but rather seems well suited to their reproductive system. Next, by uncovering the genetic mechanisms by which parental behavior evolves, we found that some genes affect the behavior of fathers and others the behavior of mothers; and some genes affect parental behavior broadly and other genes are specific to individual components of parental care. One of these genes specifically affects parental nest building, and we suggest that a major player is vasopressin, a neuropeptide that appeared early in animal evolution. 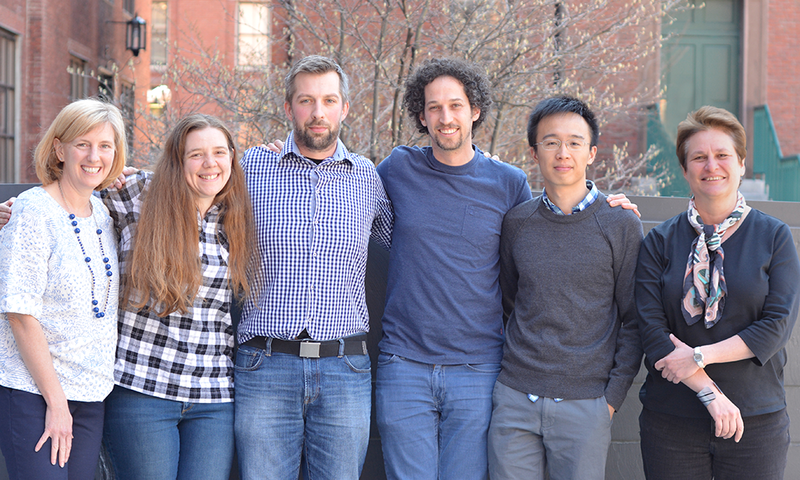 Our results identify and validate a new and surprising role for vasopressin: the inhibition of nest building in parental mice.